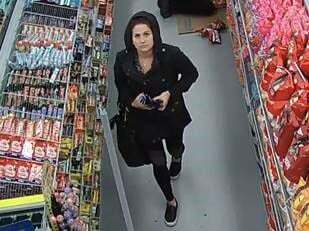 the suspect entered the store at 908 Autoroute Chomedey, took several items off the shelves and concealed them in her purse. At the exit, a security guard stopped her but she pepper-sprayed him and struck him several times. A woman witnessing the event also tried to detain her and was also sprayed. The suspect fled in an unidentified vehicle. The suspect a white female, about 27 years old, speaking French with an Arabic accent, and measures 5’ 5’’ and weighs 135 lb. She had auburn hair, a facial piercing, and wore a black coat, dark pants and black and white shoes. Any information regarding her identity will be treated confidentially by the Police Info-line at 450-662-INFO (4636) or via 911 and citing file LVL 181010 051.